I have spent time working with the Promotions and Press team, helping them prepare for Dublin Comic Con, acquiring free books, magazines and comics, and next weekend, will be with a big team of Dublin staff, as we engage, chat and talk about Dublin 2019 in The Convention Centre Dublin at Dublin Comic Con. The idea of going to a comic convention and giving away free books to promote conventions more focused on SF/F literature started with an Eastercon, LX2009. In 2008 I helped John Dowd to attend London Film and Comic Con and Thought Bubble, and we realised this could welcome new members to our cons. It is amazing the support that comic cons have given and Showmasters, who run LFCC, went on to support Loncon’s outreach efforts at their Collectormania and London Film and Comic Cons. After the idea was floated in 2009 in Montreal at the Worldcon, although receiving limited support formally from WSFS, by 2011 an Science Fiction Outreach event was planned by myself, Helen Montgomery, Chris Garcia, and Spike. We got a booth at Wondercon in San Francisco to help promote Bay Area cons and the Reno Worldcon that year. Supported by many organisations who run cons, and have run Worldcons, funds were granted and it was very successful. Helen Montgomery, who is on the Dublin committee, has gone on to lead the US SF Outreach Project efforts annually since then, and the organisation is now a registered 501(c)(3) US non-profit. Since 2011, SF Outreach has been to Emerald City Comic Con, C2E2, Dallas Comic Con, and this year they were at Silicon Valley Comic Con, working hard promoting Worldcon 76 which is in the same Convention Centre. 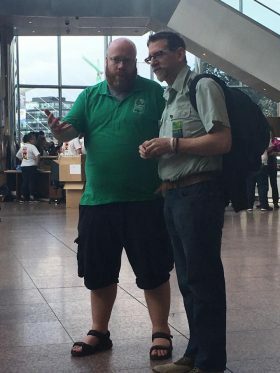 The organisers of Dublin Comic Con, Karl Walsh and Derek Cosgrave, have developed a real growing convention, and each year it has been in the Convention Centre Dublin, Dublin 2019 have been there with Free Books and Comics, promoting not only Dublin 2019, but with flyers and team members of Octocon, Titancon, Gaelcon, Eastercon and any convention that wants to help. Near the end of the day, people cycle back to the free table, all their funds exhausted in the show. Free always sounds good, and often the Outreach tables and booths are busier longer, if we haven’t run out. We do keep stock back, so every day we have a good supply. No matter where we go, we try and focus on ensuring we have something for all ages of reader. We isolate books for children and younger readers, and keep them to one side; we know adults also love them, but we conserve them so every child can walk away with a book or comic. 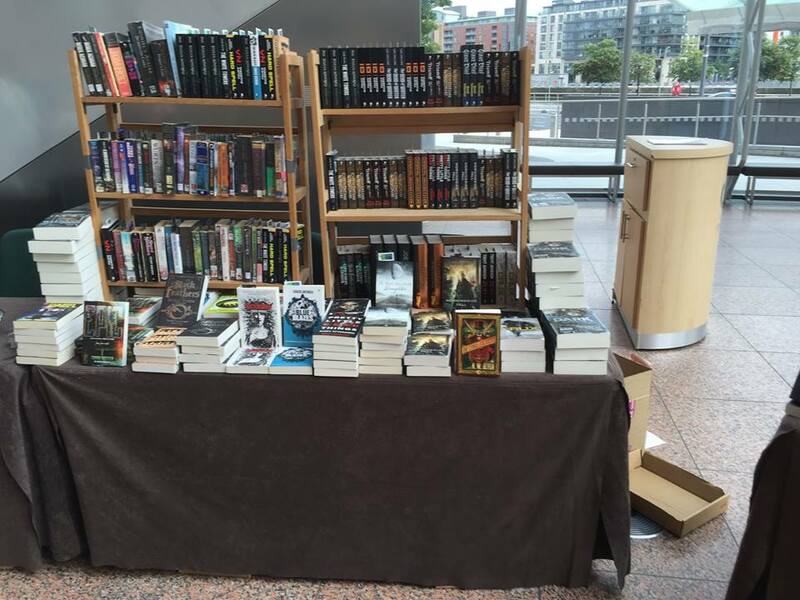 The team are also always looking for donations of books, comics, magazines, and so forth, so do get in touch with promotions@dublin2019.com if you like the sound of your less favourite books that are spare going to new readers and helping to promote SF Conventions. Our thanks to all the cons who help us, those who donate, and we hope to see you at Dublin Comic Con.